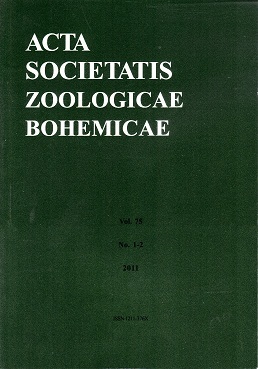 Acta Societatis Zoologicae Bohemicae (ASZB) is an international journal published by the Czech Zoological Society under this name since 1993. It includes scientific articles on general, applied and systematic zoology, biographies and book reviews, written in English. Articles by members of the Czech Zoological Society are preferred. It is understood that manuscripts submitted are not offered to any other journal for prior or simultaneous publication. Authors of taxonomic papers must respect the articles of the International Code of Zoological Nomenclature, fourth edition (2000). Since 1934, the Society has edited the scientific journal Věstník Československé zoologické společnosti, the name of which changed in 1990 to Acta Societatis Zoologicae Bohemoslovacae and in 1993 to the present name. Contributions were at first written in Czech. Since 1990 all contributions are in English. All articles are peer-reviewed. The journal is included in Zoological Records, Biological Abstracts, CAB International and Cambridge Scientific Abstracts. Executive Editor: RNDr. Marcela SKUHRAVÁ, CSc. Editorial Board: Petr BENDA, Daniel FRYNTA, Keith M. HARRIS, Ivo HODEK, Alois HONĚK, Jan KUBEČKA, František MORAVEC, Jakub PROKOP, Ivan REHÁK, Josef RUSEK, Carl SMITH and Jiří VÁVRA. Smykla J., Porazinska D. L., Iakovenko N., Janko K., Weiner W. M., Niedbała W. & Drewnik M.:Studies on Antarctic soil invertebrates: Preliminary data on rotifers (Rotatoria), with notes on other taxa from Edmonson Point (Northern Victoria Land, Continental Antarctic). Acta Societatis Zoologicae Bohemicae74: 135-140.